From the moment we moved into our house, the front column bugged us. It just did not fit with the ranch style of our house, especially since our carport had square columns. We were not sure how to change it easily until we stumbled across this post on Young House Love: They had the exact same issue we had and their house looked very similar to ours!!! After reading how they did it, we decided that we could easily do this in an afternoon, so we gathered all of our supplies. Since we just had one column, all we needed were two 1x6 boards and two 1x8 boards, our nail gun, construction adhesive, and some caulk. We basically followed the instructions that Young House Love detailed in their post to attach the boards. After we completed boxing in the post and caulking the edges and the nail holes, I primed and painted the post with White Exterior paint. 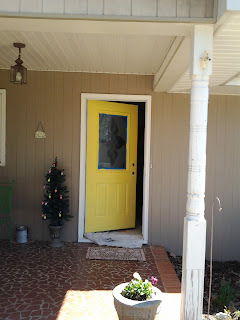 It made such a big difference in the look of our house for a small amount of time and money!